← Roxanne Dunbar-Ortiz speaks in Olympia on May 4 and 5 about her new book An Indigenous Peoples’ History of the United States. Quanah Parker Brightman is a Lakota Sioux and Creek Indian who was born in Oakland California. Quanah Brightman is the National President of United Native Americans Inc., a non-profit indigenous movement organization formed by Dr. Lehman L. Brightman in San Francisco, California in 1968 to promote the decolonization and unity of all Indigenous People. 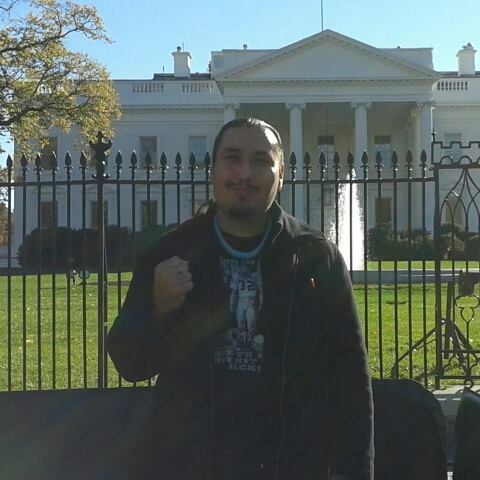 In his capacity as member of UNA, Mr. Brightman has testified before the United Nations Listening Sessions and the U.S. Department of Education’s Urban Indian Education Listening and Learning Sessions and founded Idle No More in the San Francisco Bay Area. .
Quanah Parker Brightman has led and participated in many pro-indigenous protests, marches, and sit-ins throughout the United States. Mr. Brightman is a strong advocate against the many hate crimes that are affecting Indigenous people around the world. He advocates for the enforcement of all indigenous treaties made with the United States, reparations and accountability of the theft of tribal ancestral lands and natural resources, the protection of Native American sacred sites and burial sites, pro-indigenous curriculum to be taught in public schools (K-12), ending the use of the blood quantum, improving the negative image of indigenous people and ending tribal corruption in Indian gaming. This entry was posted in Make No Bones Shows and tagged First Peoples, Honoring, Human Rights, Indigenous, KAOS 89.3 FM, Lakota, Make No Bones About It, Quanah Parker Brightman, Raven Redbone. Bookmark the permalink.